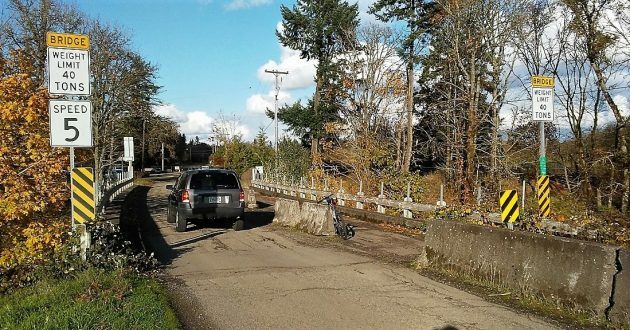 The bridge to Simpson Park, the Millersburg rail yard and Talking Water Gardens has been restricted to one lane for years. If the state transportation department approves the application for a grant, something will finally be done about the Waverly Drive bridge across Cox Creek. Built in 1957, the bridge now serves as the gateway to Simpson Park and Talking Water Gardens. It also carries motor traffic to and from the Millersburg yard of the Portland & Western Railroad. Some years ago it was briefly closed because of concerns about its soundness. Then it was reopened as a one-lane bridge, and ownership eventually passed from Linn County to Millersburg. The bridge is on my favorite bike route through town. Its neglected appearance has bugged me for years, and from time to time I would ask Linn County Roadmaster Darrin Lane about the chances of getting it repaired..
As I understand it from County Engineer Chuck Knoll, it was Lane’s idea to seek grant money from ODOT’s local bridge program to replace the ailing structure. The county prepared an application for $2,250,000 under that program, and the city of Millersburg submitted the request to ODOT on Oct.11. The county road department had already done substantial work — surveys, a flood analysis, geotechnical reports and so forth — and will likely conduct the project if Millersburg asks it to and the money is approved. Knoll says the bridge then will likely be replaced in 2020 or ’21. Shabby Chic is de rigeur. Haphazardly maintained bridges make crossing those gaps far more romantic than otherwise. I would rather see the money used to restore this bridge. They don’t make wooden guardrails like that anymore!